Maybe you saw the article? In the spring of 2015, a nine-year-old British Columbia kid quit his hockey team with two games left in the season. Seems he’d had enough of sitting on the bench game after game, crying while he watched his teammates play. Why was he denied the opportunity to play? No one knows. Apparently his coach never told him. Never explained ‘why’. Never told him what he needed to focus on or try harder at. Never even spoke to his parents. Nothing. In other words, his ‘coach’ was not a coach at all. The most successful coaches in hockey share a number of traits. They know the game, of course, and they know how to teach its mechanics, strategies and tactics. But they also know how to communicate. Because without great communication it’s really not possible to be a great teacher, motivator, or mentor. Constructive or corrective feedback is how we learn. It’s how our parents helped us get from googoo gaga to language fluency, how our teachers helped us get from one plus one to quantum physics (well, some of us anyway). In all aspects of life, it’s feedback that lets us know where we stand, and what we might need to do in order to progress to the place we want to be. Athletes at all levels need constructive feedback from the people they look to for advice and counsel on how to improve, but young athletes need it most of all. And beyond the technical and physical aspects of skating, puck handling or positional play, youth hockey coaches are teaching young athletes what it means to try, fail, and try again. They’re teaching them what it means to be a teammate, to compete with pride, character, energy and honor, and to work as part of a collective unit toward a common goal. That’s powerful stuff in the right hands. The coach-parent relationship magnifies the need for transparency and forthright communication. All parents have a need and a right to know what’s going on between their children and the adults to whom they entrust their development and wellbeing. Teachers, doctors and other professionals who interact with children provide a continuous flow of transparent and open communication. They have the tools and systems in place to make that happen. Now hockey coaches do too. PowerPlayer makes providing constructive feedback to players — and parents — easy. 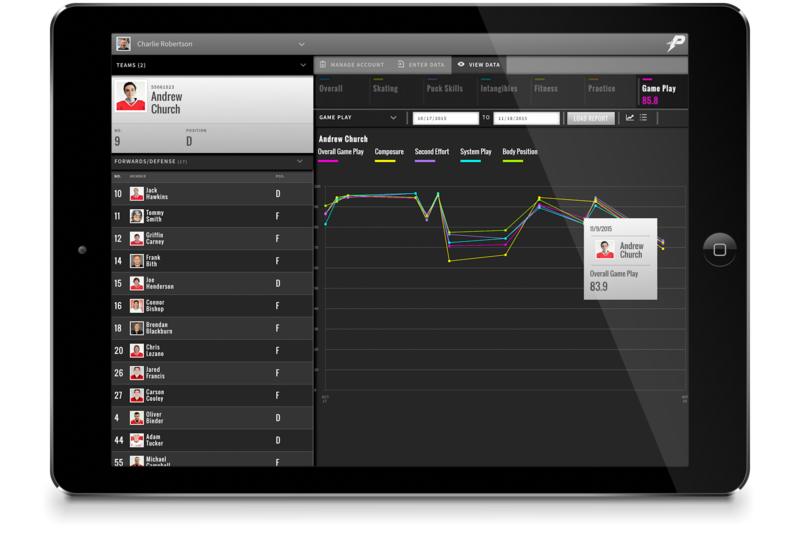 By quickly and intuitively capturing quantitative and qualitative data, video and comments, the system enables coaches to focus on and communicate instructions and feedback to each player individually, giving athletes the knowledge and sense of connection they need and providing parents with a clear understanding of coach / child interaction. Coaches who can get young athletes and their parents on the same page (or iPad screen) as themselves create trust and understanding, the foundation for solid team building.